China continued its recent courtship of Mozambique, including its offers of financial support, as part of an effort to build closer relationships with the country. During the sixth meeting of the China-Mozambique Joint Economic and Trade Commission on June 11, China’s Ministry of Commerce signed anagreement to donate $100 million, which will be used to support progress at Chinese projects, such as the Xai-Xai airport in Gaza province, Gorongosa College of Engineering in Sofala province, the Zimpeto National Stadium in Maputo, and an agricultural training program. This comes after a number of other acts of financial support to embattled Mozambique, which, together with the three-day visit of Li Zhanshu, Chairman of the National People’s Congress and a close aide to Xi Jinping, highlight the new importance given to Mozambique—and its newfound energy wealth—by Beijing officials. "We’re concerned that the consequences of entering into some of these financing arrangements will be detrimental to [small Pacific nations’] long-term sovereignty." "We are a small country and whether we object to it or not, China will go ahead with the Belt and Road plan. But what we have to make sure is that it is not exclusive [to China] and that other people can use in the same manner. It is a big country and we have to deal with them whether we like it or not." "It is important that this is a European project, but by stating that, we are not ruling out Chinese money." "Foreign investment should constitute 20% of the economy but we see the Chinese controlling our economy. If we have not yet realised it, we are being colonised. We may only realise that when it may be too late." "I am not concerned much about the burden of debt or the construction of the [Kunming-Vientiane] high-speed railway. I can see that provisions in the construction agreement are favorable." 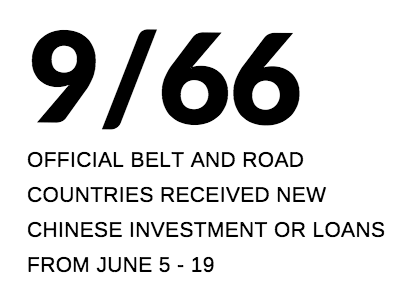 June 13: Bank of China issued a $3.2 billion Belt and Road bond through itsSingapore, Luxembourg, Australian, and New Zealand branches. Proceeds will go towards financing Belt and Road projects. The first Belt and Road bond issuance, by Hongshi Holding Group, took place this past January. Hongshi stated that the proceeds would be used to purchase equipment for its cement plant in Laos. Observers have noted that the new Belt and Road bond category under the China Securities Regulatory Commission doesn’t appear to bring issuers pricing benefits or other incentives. June 8: The groundbreaking ceremony for the Philippines’ Chico River Pump Irrigation Project took place in Kalinga province. 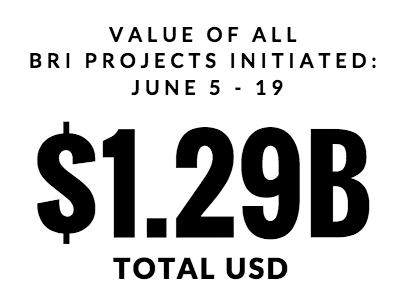 This is the first project to befinanced by China under the Philippines’s “Build, Build, Build” initiative, using $62.08 million in preferential buyer’s credit loans. China CAMC Engineering was awarded the project contract in March, valued at $73.04 million. The project entails constructing new substations and supporting transmission lines, tunnels, channels, and other facilities to provide irrigation for farmland.June 19: The 2018 Laos’ National Economic Development Planning and Strategy Training Workshop began in Vientiane, with support from the Laos-China Cooperation Commission and the Academy of International Business Officials under China’s Ministry of Commerce. 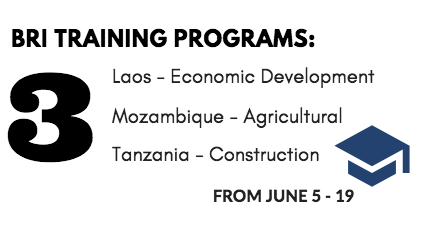 Representatives from economic planning departments across Laos will participate in a 21-day training program with Chinese instructors. June 6: Sri Lanka’s cabinet approved a proposal by urban planning consultancy Surbana Jurong, owned by Singapore-based Temasek Holdings, for the Chinese investment zone in Hambantota and the adjoining district of Monaragala. Surbana Jurong was appointed by Hambantota port developer China Harbour Engineering Company. The zone has been proposed as a simultaneous urban development, including social infrastructure such as schools and housing.June 10: China Merchants Port Holdings Company (CMPort) has withheld its third and final payment to the Sri Lanka Ports Authority (SLPA) for the Hambantota Port public-private partnership in the amount of $585 million over a dispute involving land use. CMPort seeks to develop an artificial entertainment zone, while SLPA has publicly stated that the reclaimed land will not be used for entertainment or tourism purposes—only for “marine and port-related activities.”June 13: China International Contractors Association and the Chamber of Construction Industry of Sri Lanka signed an MoU to pursue projects under the the framework of the Belt and Road Initiative. The agreement was signed on the sidelines of the International Infrastructure Investment and Construction Forum in Macau. Member firms from both organizations willcooperate to establish partnerships, facilitate investments, and develop construction projects in China and Sri Lanka. June 6: Beijing Tai Cloud Technology partnered with Dubai’s Duwaya Investment Group to launch operations in the UAE. 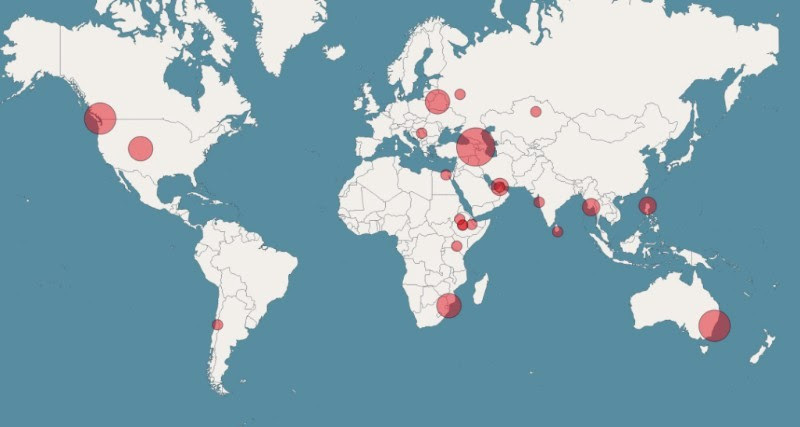 Tai Cloud established the Tai Cloud Dubai Branch and China Blockchain Application Research Centre (Dubai), along with blockchain technology programs, in support of Dubai’s Smart City initiative.June 12: China’s Weiyuan Minerals and military-owned Egyptian Black Sand Company signed an agreement to establish a joint Chinese-Egyptian company to extract minerals from Egypt’s black sand deposits in the Nile Delta, primarily between Alexandria and Rosetta. Egyptian Black Sand Company is majority owned by the Egyptian Armed Forces. Minority shareholders include Kafr El Sheikh Governorate, Egypt’s National Investment Bank, Nuclear Materials Authority, and the Egyptian Company for Mineral Resources.June 13: Cainiao Smart Logistics Network, the logistics arm of China’s Alibaba Group, signed an MoU with SkyCargo, the air freight arm of UAE flagship carrier Emirate Airline, to jointly facilitate international parcel delivery. Cainiao and SkyCargo will work together to manage e-commerce shipments in the Middle East via Dubai and enhance customer experience as Cainiao develops new global hubs in six cities including Dubai. June 5: During the sixth meeting of the China-Mozambique Joint Economic and Trade Commission, China’s Ministry of Commerce signed an agreement to donate $100 million to Mozambique in support of four development projects: the Xai-Xai airport in Gaza province, Gorongosa College of Engineering in Sofala province, the Zimpeto National Stadium in Maputo, and an agricultural training program in China for Mozambican workers.June 6: China-Africa E-Commerce Co. launched ca-b2b.com, a new cross-border e-commerce platform which will provide online contracting, payment, customs declaration, and foreign exchange settlement services to businesses in 17 categories, including oil and gas, information communication technology, raw materials, and healthcare. The platform will also provide access to third-party legal, logistics, and insurance services.June 6: The second phase of the Fixed Biological Safety Laboratory Technical Cooperation Project launched in Sierra Leone's capital of Freetown, under the China-Africa Public Health Cooperation Plan. Experts from the Chinese Center for Disease Control and Prevention’s Global Public Health Center and Sierra Leone’s Ministry of Health and Sanitation seek to work together, withsupport from the World Health Organization, to improve the country’s disease prevention, control, and response capabilities.June 7: The Ethiopian Roads Authority (ERA) awarded nine road projects to four Chinese and four local companies. 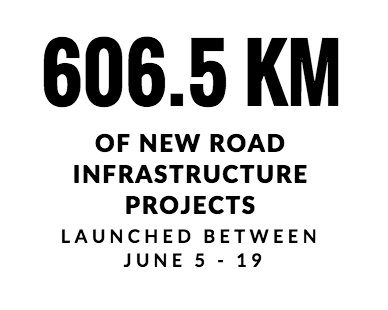 Beijing Urban Construction Group was awarded a 68.8-km road from Debarque to Zariema in Amhara regional state for $77.3 million. 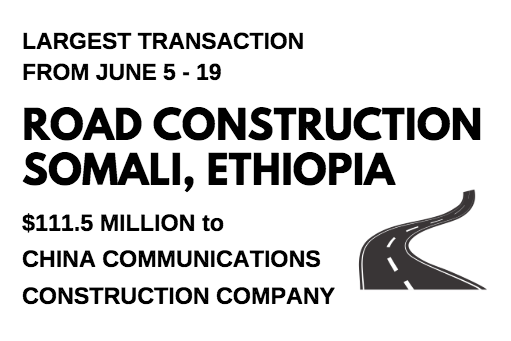 China Communications Construction Company (CCCC) was awarded a 135-km road and a 102-km road in Somali regional state for $111.5 million. 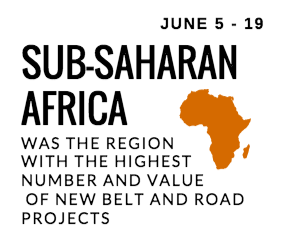 CGC Overseas Construction (CGCOC) Group was awarded a 97.5-km road in Oromia regional state for $63.9 million, and China Railway 21st Bureau Group was awarded a 76-km road in the Southern regional state for $56.2 million. ERA stated that it had screened the Chinese companies with the help of the Chinese Embassy in Ethiopia.June 7: Two local Basotho-owned companies, Sigma Construction and LSP Construction, wrote a letter to the parliamentary Public Accounts Committee (PAC) to register concerns about the disproportionate award of major construction tenders to Chinese companies, alleging government non-transparency, corruption, and bias. The Consortium of Lesotho Contractors, an association of 32 Basotho-owned companies, wrote a similar letter to the PAC.June 11: The Eastern Industry Zone in Dukem, Ethiopia plans to commence a second phase of construction to expand due to high demand. The zone, which has run out of land for new investors, was developed in 2007 and is owned by China’s Jiangsu Qiyuan Group, Jiangsu Yonggang Group, Zhangjiagang City Yangyang Pipe Company, and Zhangjiagang Free Trade Zone Jianglian International Trading Company.June 12: Chinese construction company Group Six International Limited (GSIL) will fund a team of Tanzanians to participate in a month-long Belt and Road Initiative training program in China. The team includes engineers and officers from the Tanzania Contractors Registration Board, Engineers Registration Board, Architects and Quantity Surveyors Registration Board, Occupational Safety and Health Authority, and Tanzania Rural and Urban Roads Agency.June 15: The Ugandan government and National Committee of the Chinese People’s Political Consultative Conference commissioned the 51.4-km Kampala-Entebbe Expressway built by China Communications Construction Company (CCCC). Construction on the four-lane toll expressway began in November 2012 and was completed over a year behind schedule. Ugandafinanced $350 million of the $476 million project with a loan from the Export-Import Bank of China.June 16: Zambia-based Chinese gas manufacturer Chingases Company plans to invest $15 million to build factories in Zimbabwe’s proposed Bulawayo Special Economic Zone. The factories would include three units to produce: oxygen, nitrogen, and compressed air for medical use; acetylene for welding and cutting; and liquefied petroleum gas (LPG) for industrial and domestic use.June 19: Kenyan President Uhuru Kenyatta announced plans to open two new consulates in Guangzhou and Shanghai to facilitate Kenya’s expanding trade and bilateral relationship with China. Kenyatta cited the influx of Chinese investments, grants, and scholarships over the past few years as the basis for this expansion. June 6-8: China and Kazakhstan signed several agreements during President Nursultan Nazarbayev’s visit to Beijing. Among the number of deals reached were a cooperation agreement on preventing the illegal movement of nuclear and radioactive materials; an MoU between China’s NDRC and Kazakhstan’s Ministry of Investments and Development on approving joint industrialization projects; and a memorandum between China’s Ministry of Commerce and Kazakhstan’s Ministry of National Economy on e-commerce cooperation.June 7: A delegation from China University of Petroleum - Beijing (CUPB) reached an agreement with Azerbaijan's Baku Higher Oil School (BHOS) toestablish an educational exchange program. It was also decided that CUPB and BHOS will sign a cooperation agreement in October 2018.June 8: China Railway Express and Russia’s RZD Logistics signed a memorandum to jointly develop a market for high-speed freight services between China, Russia, and Europe. Target sectors include cross-border electronic commerce and express delivery services.June 9: The Silk Road Fund signed a strategic partnership memorandum withKazakhstan’s Astana International Financial Center and a framework agreement with Astana International Exchange. Through this partnership, the two Kazakh entities will become shareholders in the Silk Road Fund’s wholly-owned subsidiary, the China-Kazakhstan Production Capacity Cooperation Fund. China and Kazakhstan are reportedly seeking to better align the Belt and Road Initiative with the Nurly Zhol (Bright Path) economic policy through increased financial cooperation. June 7: Chinese meat producer Qingdao Rongxing plans to establish a logistics complex in the industrial zone of Indjija, Serbia. Company representatives have visited Indjija to inspect local investment conditions. Qingdao Rongxing supplies chicken meat globally to restaurant chains, such as KFC.June 11: Finnish businessman Peter Vesterbacka plans to seek Chinese funding for the FinEst Bay Area project, his private iteration of a 100-km undersea train tunnel linking Helsinki with Tallinn, Estonia. Vesterbackaproposes that the tunnel becomes part of the Belt and Road Initiative. FinEst Bay Area is competing with the Finnish and Estonian governments’ FinEst Link project, a public iteration of the same undersea tunnel. Both projects are estimated to cost $18-24 billion and have yet to secure public or private financing.June 11: The newly created China International Development Cooperation Agency signed several agreements with Belarus, which include a grant of $123.4 million in technical and economic aid for implementing a series of investment projects, such as the construction of the National Football Stadium and the China-Belarus Center for Cooperation in Transforming Technology Solutions in the China-Belarus Great Stone Industrial Park; a concessional loan agreement for building a high-tech full-cycle agricultural enterprise; and a memorandum of cooperation to develop human potential in mechanical engineering and healthcare. Most of the expenses associated with these projects are being assumed by the Chinese government.June 11: China’s Ministry of Commerce and Belarus’ Ministry of Economy signed what they describe as “a memorandum on cooperative development of strategic medium and long-term programs.” The two countries will hold business forums, roundtable sessions, and company meetings to encourage Chinese investment in Belarusian companies, establish joint ventures, explore new market niches, increase cooperation in transport and logistics, promote sectoral research, develop new interregional contacts, and expand cooperationin manufacturing, finance, and information technology.June 12: China’s UnionPay card payment system launched operations inSerbia, allowing Chinese companies and individuals to use their bank cards at state-run lender Banka Postanska Stedionica’s ATMs. In the near future, Banka Postanska Stedionica will also allow UnionPay card payments at POS terminals across Serbia.June 12: The Zhongguancun Industrial Innovation Center - Paris Region wasunveiled in Beijing’s Zhongguancun Science and Technology Zone. Zhongguancun Administrative Committee and France's Paris Region Economic Development Agency agreed to strengthen scientific and technological cooperation through innovation incubators, visits and exchanges, and consulting.June 15: Sino-China Investment Group expressed interest in establishing a $1.2 billion fund to invest in transport, energy, telecommunications, agriculture, and construction projects in Serbia. The group recently met with Serbia’s National Council for Cooperation to discuss potential projects, in which Power Construction Corporation of China (PowerChina) and the Shanghai Stock Exchange may be interested in investing.June 15: Subsidiaries of China Energy Engineering Company (CEEC) entered into several MoUs and agreements with local energy companies during the Central and Eastern European Power Market Seminar in Vilnius, Lithuania. CEEC subsidiary North China Power Engineering signed an MoU with Lithuania's Achemos Grupe to jointly develop new energy projects, and an agreement with Ukraine's Metropoliya MC to develop a 200MW photovoltaic (PV) project valued at $253 million. CEEC subsidiary China Energy Engineering Group Investment signed an MoU with Lithuania's Orion Securities Group to jointly invest in conventional and renewable energy projects.June 18: The City of London, a district of the British capital that hosts the central business district, hosted the UK-China Belt and Road Insurance Cooperation Forum. Lloyd's of London expressed interest in supporting Belt and Road projects by providing insurance and reinsurance products, and the City of London introduced its Joint Code of Practice for Risk Management of Tunnel Works.June 19: A delegation from Belarusian Railways met with officials atGermany’s Port of Duisburg to discuss developing freight container shipping along the China-Belarus-Germany route. The discussion was reportedly precipitated by the expanded use of the China-Belarus Great Stone Industrial Park. June 18: The Zhejiang Provincial Committee of the China Council for the Promotion of International Trade signed an MoU with Cuba’s Chamber of Commerce to cooperate in business development, bilateral exchange, investment, and other commercial activities. Cuba has signed several similaragreements with other Chinese provinces. Companies from Zhejiang and Cuba held a two-day business forum in commemoration of the signing.June 18: China and Bolivia signed a memorandum on integrating Bolivia into the Belt and Road framework during Bolivian President Evo Morales’s Beijing visit, as well as other documents establishing a bilateral strategic partnership. The two countries discussed several agricultural agreements and infrastructure projects, including a 228-km double lane road from Bombeo to Villa Tunari that China will finance with a $31 million donation.